The Daimler SP250 is a sports car built by the Daimler Company, a British manufacturer in Coventry, from 1959 to 1964. It was the last car to be launched by Daimler before its parent company, the Birmingham Small Arms Company (BSA), sold it to Jaguar Cars in 1960. Shortly after being appointed Managing Director (Chief Executive) of BSA's Automotive Division in 1956, Edward Turner was asked to design a saloon car powered by a V8 engine. The engine drawings were finalised by March 1958, but the saloon prototype, project number DN250, was not available for examination by the committee formed in 1958 to report on the feasibility of the V8 cars. The committee's evaluation centred on the prototypes being tested at the time, which were for the SP250 sports car project. According to the feasibility study conducted by the committee, the SP250 would generate a profit of more than £700,000 based on a projection of 1,500 cars being sold in the first year of production and 3,000 cars per year for the second and third years of production. Two-thirds of the sales of the car were expected to be in the United States. The study also determined that the body should be made from fibreglass, with shorter time to the beginning of production, tooling costs of £16,000 as opposed to £120,000 for steel bodies, and lower cost to change the styling. The original version, later called the A-spec, could reach a speed of 120 mph (193 km/h), but the chassis, a "14-gauge ladder frame with cruciform bracing" based on the Triumph TR3, flexed so much that doors occasionally came open, marring its reputation. Bumpers were originally an optional extra. With the basic specification not including full bumpers, the A-spec. cars have two short, chromium-plated 'whiskers' on the body on either side of the front grille and two short, vertical bumpers, or "overriders" at the rear, which were not included if the rear bumper was optioned. Early A-spec. cars had recesses behind the door handles, but these were phased out. The manual gearbox, the first of the type used by Daimler since they started using the pre-selector type across their range in the 1930s, was reverse-engineered from the Standard gearbox used in the Triumph TR3A. Original specification SP250 with chrome front quarter flashes or "whiskers"
The SP250 had a fibreglass body, four-wheel Girling disc brakes, and a 2.5-litre Hemi-head V8 engine designed by Edward Turner. The car was described as a 2+2, but the bench-like rear seat offered very limited leg-room unless the front seats were pushed fully forward. Engine: V 8 iron block, water cooled, OHV, bore 76 mm x stroke 70 mm, capacity 2547 cc. Single central camshaft operated valves through short pushrods with double heavy-duty valve springs. Aluminium alloy hemispherical cylinder heads. Stiff 5 main bearing crankshaft, dynamically balanced. Compression ratio 8.2:1. Twin SU carburettors. bhp 140 @ 5800 rpm. Max Torque 155 lb⋅ft (210 N⋅m) at 3600 rpm. SU electric fuel pump. Ignition: Coil and distributor with conventional automatic advance & retard. Lubrication: Submerged gear oil pump with full flow filter. Sump capacity 1.75 US gallons. Cooling: Pressurised radiator with fan, pump and thermostat control. Transmission: 4 speeds with synchromesh on top three ratios. Provision for overdrive. Automatic optional. Suspension: Front independent with coil springs. Rear live axle with half-elliptic leaf springs. Oversize dampers. Brakes: Girling Discs on all four wheels, hydraulic operation. The management of Daimler decided to make a large number of the car's features optional extras because automotive import duties into the United States were not applied to optional extras. The SP250 was launched as the Daimler Dart in April 1959 at the New York Motor Show, where it was unofficially voted as the ugliest car at the show. Chrysler, whose Dodge division owned the trademark for the "Dart" model name, ordered Daimler to change the name under threat of legal action. With little time to come up with a new name, Daimler used the project number, SP250, as the model number. Between twenty-six and thirty black SP250s were used by the British Metropolitan Police in London. These were used by the Traffic Department to catch up with speeders, especially café racers. The police cars used the Borg-Warner Model 8 3-speed automatic, which the Metropolitan Police found to be better for town work and high speed chases, and was also found to be more economical, avoiding the clutch wear that a manual car would develop with usage between 18 and 24 hours a day. Traffic police in Bristol, Cambridge, Liverpool, Manchester, Southend and Surrey also used the SP250 for speed enforcement, as did police forces in Australia and New Zealand. After the opening of the first section of the M1 in 1959, the Bedfordshire police used the SP250 for motorway patrol. Jaguar bought Daimler in 1960, and were immediately concerned about the chassis flex. They brought out the B-spec. version with extra outriggers on the chassis and a strengthening hoop between the A-posts. There were also other detail improvements, including an adjustable steering column. B-spec. and C-spec. cars do not have the 'whiskers' that A-spec. have and some do not have the optional front bumper, so there is very little front protection for these cars. The C-spec. version, introduced in April 1963, included a trickle charger socket, a heater/demister unit, and a cigarette lighter as standard equipment. The DP250 was a sports saloon based on the SP250's chassis. A DP250, built on chassis no. 100571, was exhibited in 1959 at Hooper's stand during the coachbuilder's last appearance at the Earls Court Motor Show. Daimler had prepared a sales brochure for the DP250, but it did not enter production. Between two and seven prototypes were made. The show car had a steel body, but some of the prototypes may have been made from fibreglass. After Jaguar Cars bought the Daimler Company from BSA, William Lyons ordered a fibreglass-bodied DP250 prototype to be completed. Upon seeing the finished car he had it scrapped immediately and ended the project. None of the prototypes survive; the show car is believed to have been destroyed while being tested at MIRA. Ogle Design produced a coupé version called the SX250. It was shown at the 1962 Earls Court Motor Show, but it was not taken up by Daimler and the body design was later used for the Reliant Scimitar. A car with hard top tested by The Motor magazine in 1960 had a top speed of 123.7 mph (199.1 km/h) and accelerated from 0–60 mph (97 km/h) in 8.9 seconds. A fuel consumption of 25 miles per imperial gallon (11 L/100 km; 21 mpg‑US) was recorded. The test car cost £1,489 including taxes. 2,654 SP250s were produced in five years of production, far short of the projection of 3,000 per year by the second year of production. Jaguar built a prototype replacement under project number SP252 with a neater body style but decided not to proceed with production. According to former Jaguar chairman Lofty England, the cost to build the SP252 would have been greater than that of Jaguar's popular and more expensive E-Type, thereby creating internal competition from a product with no practical profit margin and with uncertain market acceptance. The 2½ litre V8 engine used in the SP250 was used by Jaguar to power the smaller saloon Daimler had wanted from the start. This was basically a Jaguar Mark 2 with the V8 engine from the SP250 modified to fit in the Mark 2 engine bay and revised interior, trim, and suspension settings. Sold between 1962 and 1967 as the Daimler 2½-litre V8 and from 1967 to 1969 as the Daimler V8-250, this was, as at 1995, the Daimler car with the highest production figures. Spot-on produced a model of the SP250 in the 1960s, available in a number of colours including red and light blue. Crossway models introduced a model in 2007, available in various colours and with or without the hood up. NOREV produced an open top SP2520 model in BRG and possibly other colours. Oxford Diecasts produced several versions of the SP250 with wire or steel wheels in Police and civilian versions both open, side windows raised and with top closed. Modesty Blaise had an ivory-coloured SP250 in the early book versions of her adventures, and it also appeared occasionally in the comic strip. An SP250 features briefly in the film The Fast Lady. A green SP250 was used in the ITV Series Heartbeat in 2005. A red Daimler SP250 appears in the opening sequence of the BBC Antiques Roadshow  Series 33 "Meanwhile, Fiona takes a spin in the car that stars in the programme's opening sequence - the classic Daimler Dart." In the movie "Viva Las Vegas", a Daimler Dart can be seen on screen as Elvis Presley and Cesare Danova are inspecting Ann-Margret's car. ^ Smith 1972, p. 270. ^ a b Willson 1995, p. 72. ^ a b c d e "The Daimler SP250 sports". The Motor. 15 June 1960. ^ Clew 2007, p. 82. ^ Long 2008, p. 19. ^ Long 2008, pp. 19, 26, 27. ^ Long 2008, pp. 27-29. ^ a b c Long 2008, p. 27. ^ Long 2008, pp. 27, 30. ^ a b "Daimler SP250". Is-it-a-lemon. Retrieved 29 November 2006. ^ a b c Long 2008, p. 97. ^ a b c Long 2008, p. 70. ^ Long 2008, pp. 66, 68. ^ Smith 1972, p. 293. ^ Long 2008, p. 168. ^ Robson & Bonds 2002, p. 129. ^ Long 2008, p. 61. ^ a b c d Willson 1995, p. 74. ^ Long 2008, pp. 52, 54. ^ a b Long 2008, p. 54. ^ Lawrence 1996, p. 89. ^ a b c Long 2008, p. 116. ^ Long 2008, p. 114. ^ a b Long 2008, p. 115. ^ a b c Smith 1972, p. 276. ^ Long 2008, p. 118. ^ a b Long 2008, p. 82. ^ Long 2008, p. 81. ^ a b Smith 1972, p. 282. ^ Long 2008, pp. 86–87. ^ a b Long 2008, p. 85. ^ Long 2008, p. 86. ^ a b c Douglas-Scott-Montagu & Burgess-Wise 1995, p. 280. ^ a b Smith 1972, pp. 283–284. ^ a b Long 2008, p. 148. ^ Long 2008, p. 152. ^ Long & 20086, p. 183. ^ Long 2008, p. 129. ^ a b Long 2008, pp. 133, 137. ^ Douglas-Scott-Montagu & Burgess-Wise 1995, p. 279. Clew, Jeff (1 February 2007). Edward Turner: The Man Behind the Motorcycles (Biography) (revised ed.). Veloce Publishing. p. 82. ISBN 978-1-8458-4065-5. Retrieved 17 June 2012. Douglas-Scott-Montagu, Edward John Barrington & Burgess-Wise, David (1995). "Chapter 9—Under New Management". Daimler Century: The full history of Britain's oldest car maker. Foreword by HRH The Duke of Edinburgh. Sparkford, Nr Yeovil, Somerset, UK: Patrick Stephens. pp. 271–294. ISBN 1 85260 494 8. Lawrence, Mike (1996) . "Daimler (GB)". A to Z of Sports Cars 1945-1990 (Paperback ed.). Bay View Books. pp. 89–90. ISBN 1-870979-81-8. Retrieved 2 December 2014. Long, Brian (2008). Daimler V8 S.P. 250 (2nd ed.). Veloce Publishing. ISBN 1-9047-8877-7. Robson, Graham; Bonds, Ray (2002). 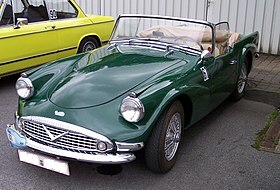 "Daimler SP250 ('Dart')". The Illustrated Directory of Sports Cars. MBI Publishing. p. 129. ISBN 0-7603-1418-7. The new car, which Daimler wanted to call the 'Dart' until Dodge complained that it held the trade mark rights to that name, had a chassis and suspension layout which was unashamedly and admittedly copied from that of the Triumph TR3A (both cars were built in Coventry, England), as was the gearbox. Smith, Brian E. (1972). "Chapter 11—The SP250". The Daimler Tradition. Isleworth, UK: Transport Bookman. pp. 269–284. ISBN 085184 004 3. Willson, Quentin (1995). The Ultimate Classic Car Book. DK Publishing, Inc. p. 72. ISBN 0-7894-0159-2. Wikimedia Commons has media related to Daimler SP250.